What's up dilly...I'm killing myself later today. I agree with the punishment of sawing his head off. I'm back Master. will you come visit me tonight and teach me a lesson. I'm thinking the kid's teacher shoved his head through that chair. What the heck does he have stuck in his mouth? Did they REWARD him by giving him a LOLLIPOP?!!! I and lollipop lovers everywhere feel distinctly ripped off. What a waste of a good lolly. Gahh, how stupid can you be?! I can't believe he stuck his head through a chair. 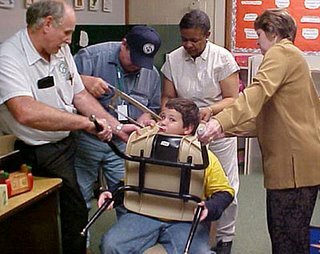 The yearbook will read "Boy Most Likely To Have Head Stuck In Chair" for the rest of his life, if I have anything to say about it. I thought my tax dollars were being used to prevent things like this. 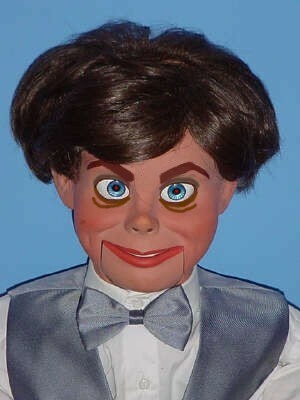 Oh, Slappy... will you be my valentine?